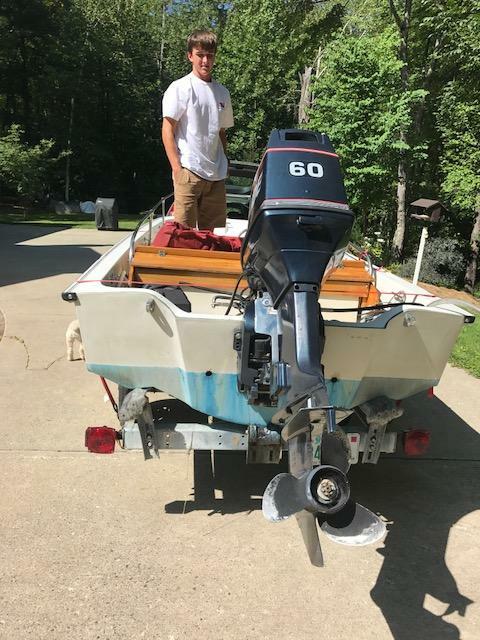 Anyway, here's the boat, 15' SuperSport with a 60hp Evinrude and a good base for a project Whaler. 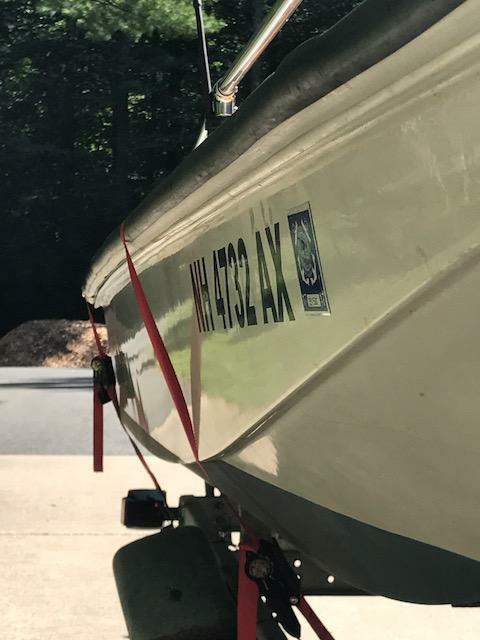 The boat spent it's life on NH lakes and the first owner was a builder working on a large lake and this was his primary mode of transportation to all the islands and lakeside properties he built. The second owner wanted to upgrade since he had 3 kids and was originally from my area. - Trailer new rollers, swap guide ons from my other trailer, LED lights, tongue jack and misc. - Awlgrip the interior with a 2 tone color like the 13' I did 10 years ago. 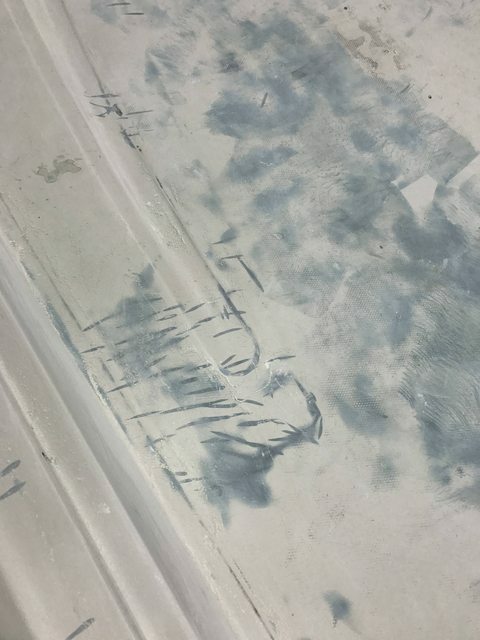 The only marks to the bottom are from a failed trailer roller and there is minor scratches in the gelcoat. Last edited by dtmackey on Sun Aug 26, 2018 8:44 pm, edited 4 times in total. 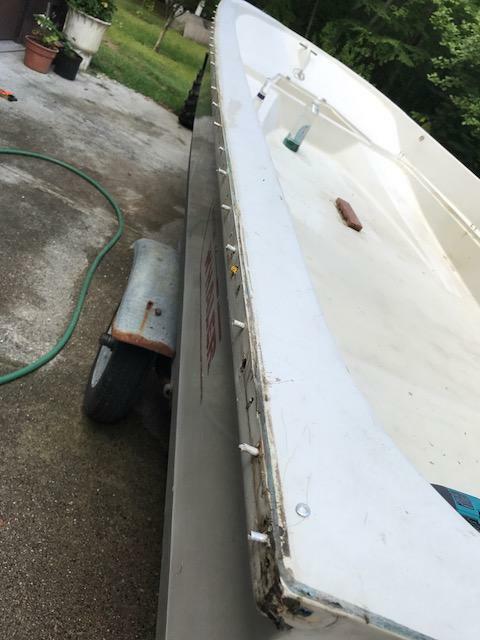 Gutted the Whaler, removed and trashed rubrail and removed from trailer and ordered new rollers, fenders, made new bunks and other misc stuff so the trailer is solid again. 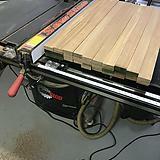 Saving the rail to reinstall after new interior is made. Rubrail removed, drilling the alum rivets is a PITA, but they hold better than screws. Removed from trailer so I can get trailer work done. 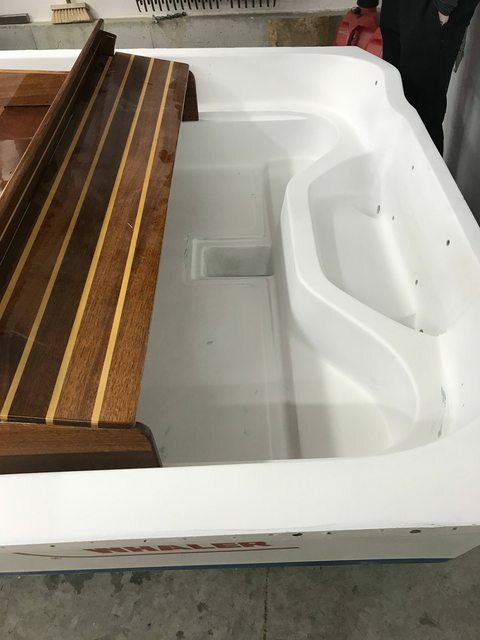 New tank in the boat so I could mock up interior mods to fit a 15 gal underseat tanks. 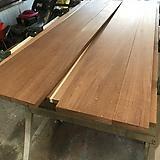 Interior removed and ready to be duplicated from new mahogany. 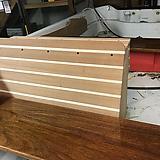 Seats will be solid 5/4" single plank milled from one solid 12' wide mahogany board. 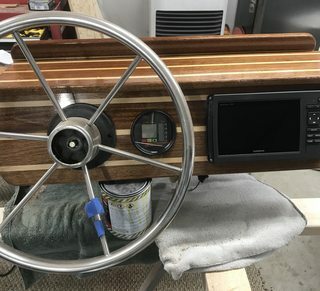 The rest of the interior will be modified so the console sits 2-3" taller to make room for a flush mount plotter and the rear seat 1" taller to make room for an underseat tank. The rear compartment will only be 1/2 depth due to tank. 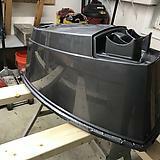 Here are pics of what it would like new (before my mods). 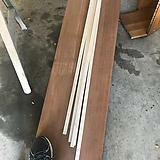 Headed to the place I purchased mahogany from when I did the 13' Whaler project and the widths and lengths they had were not ideal and would have produced lots of waste. It was fun going through their inventory though. 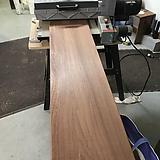 Mahogany boards over 4' wide. Prices were $9 - $11 pbf and I'm headed to another yard where the prices are in the $7 pbf and will visit next Sat. 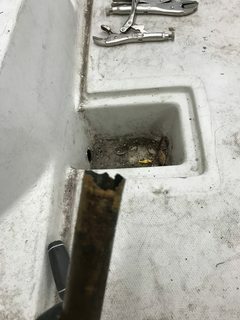 This morning I headed to grab the motor I looked at earlier this week and removed it from the boat. Motor is nice and included controls, rigging and tach. Getting it into the truck wasn't fun at 225lbs. 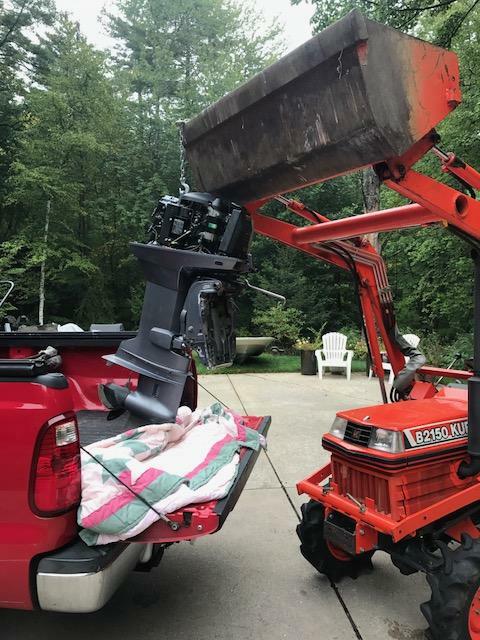 Unloading was a little easier and I used the outboard unloader tool, which comes in handy. 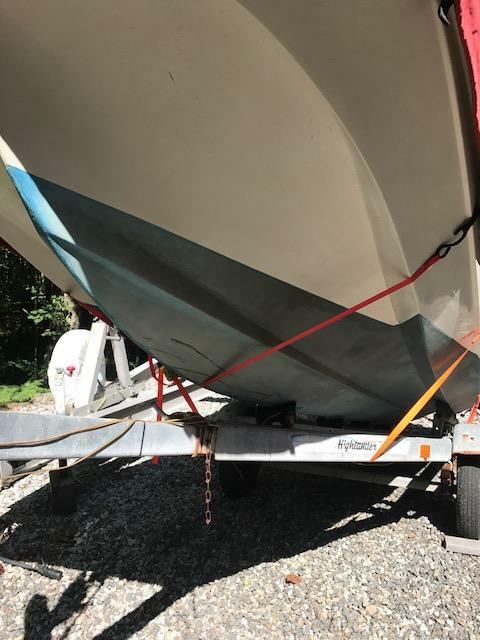 Installed the new rollers and bunks on the trailer and the boat slid right on. 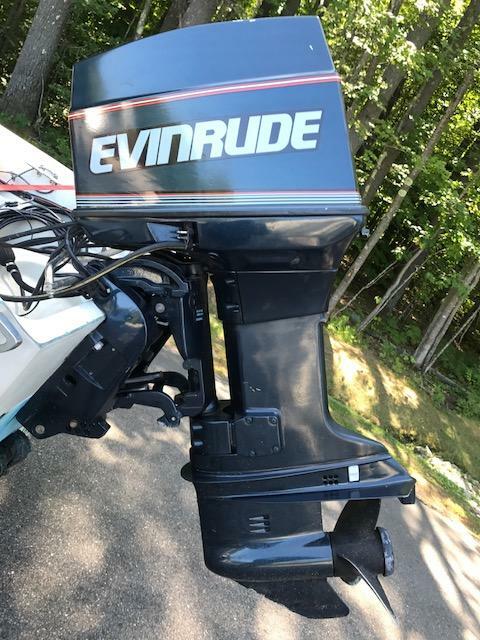 The Evinrude was listed and sold. 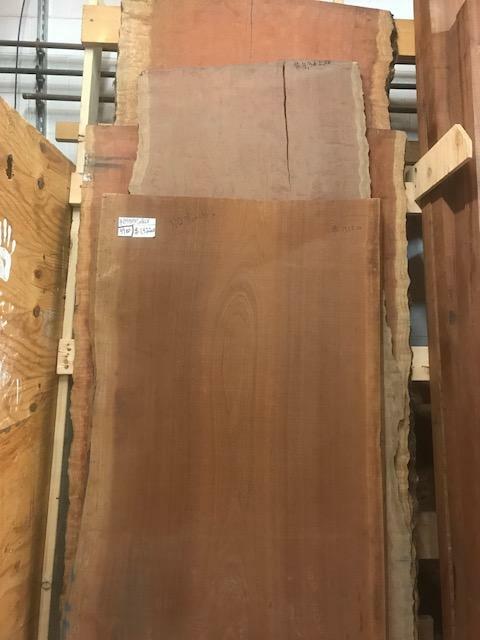 Visited three lumber yards last week that carried exotic woods, and the first two were disappointing. A 50-mile ride to NH was worth the time and gas. This place has everything and I mean everything. This is just one of the wood sheds. Met the owners daughter and told her how impressed I was with the lumber yard and she mentioned that they work hard to carry as much as they can and appreciated the positive comment. 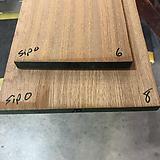 Purchased a bunch of Sipo Mahogany and soft maple since they are almost the same in hardness. This board is 14" across. 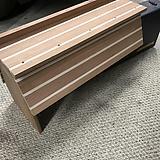 This will be for the console and seat back along with the storage compartment that I'm extending 3". 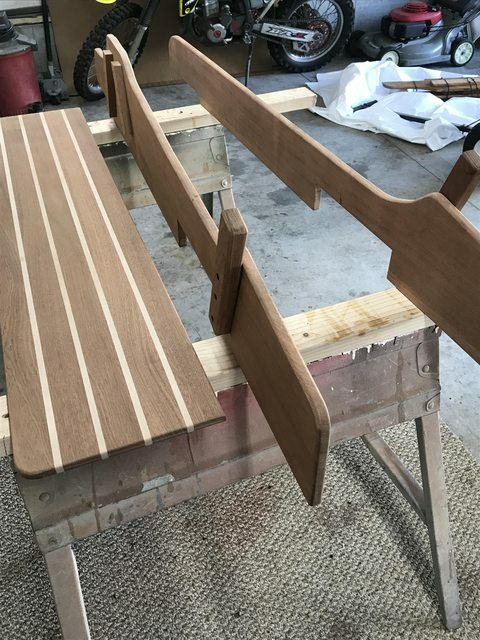 Seats in 5/4" ready to be glued. Side already cut and raised 1.5". Need to purchase another couple boards and will be all set. Love the way this looks. I love this thread and the great restoration work it details. Your work is excellent! 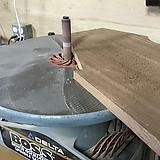 Bought the remaining wood and prepped it for glue. Also planed and sanded the seats and put a nice radius on the edges. This is the fuel fill that will be mounted in the rear storage compartment with a hose direct to the 15 gal tank. 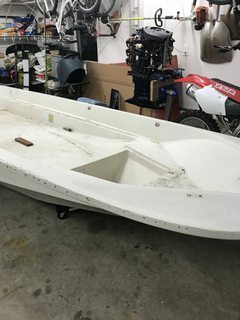 Next weekend I can cut everything to size and fit in the boat and then start sanding and prepping for finish work. I'm actually in the medical field and after a day in the office I look forward to coming home and working on projects. I've been doing this type of thing for years. I really enjoy taking something that needs work and restoring it with some custom touches to stand apart from others. Where is this mythical exotic wood warehouse you speak of? Really nice work! But your 15' looked pretty dang snappy to begin with! 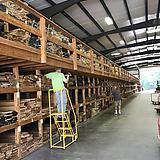 Riptide23WA wrote: Where is this mythical exotic wood warehouse you speak of? 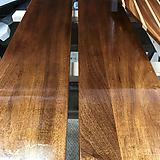 Brentwood NH on Rt 125 is the place with great mahogany options. They do not ship, have to be there in person to select your own boards. Sanded the wood this weekend and cutting the bow locked took forever as it was not straight from Whaler and took some finessing. Here is with the first coat of Epithanes and still rough looking. 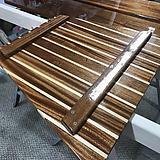 Seats have 3 coats of West Epoxy (207 hardner) and 3 coats of Epithanes varnish, so far. 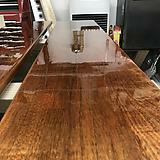 Pics don't do it justice as you look into the wood through the finish. 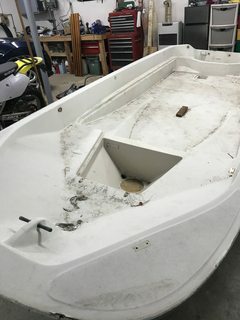 Goal is to have the interior wrapped up and done before I start the hull and engine part of the project. 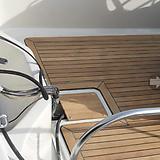 They have excellent choices of marine lumber & plywood and ship anywhere. They were my main supplier when I was restoring old Chris-Crafts, Thompson's and Hacker's. 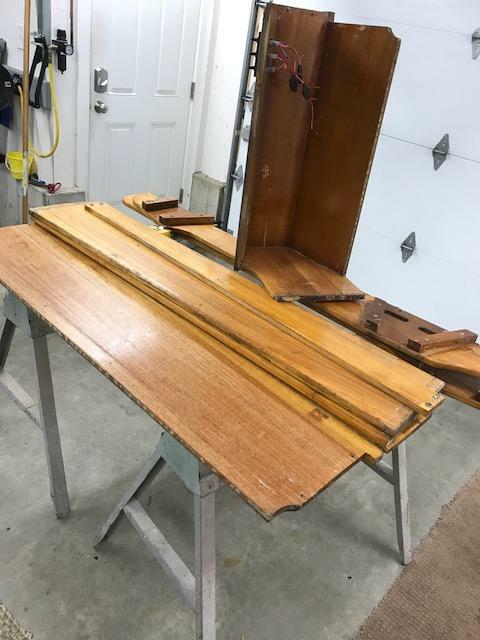 Riptide and Dutchman - here's a good link on the different woods to use for interior pieces. 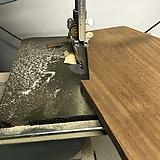 Utile/Sapele/African mahogany. And they say that Utile is Sipo for clarification. That site L.L Johnson has some good prices, it that milled or rough pricing? Random piece I glued up from scraps. 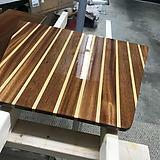 Too thin for a cutting board, but looks nice. Any ideas what to do with it? Roughed out the console tonight and still need to radius a couple corners and rout all the edges. Took far longer than expected. 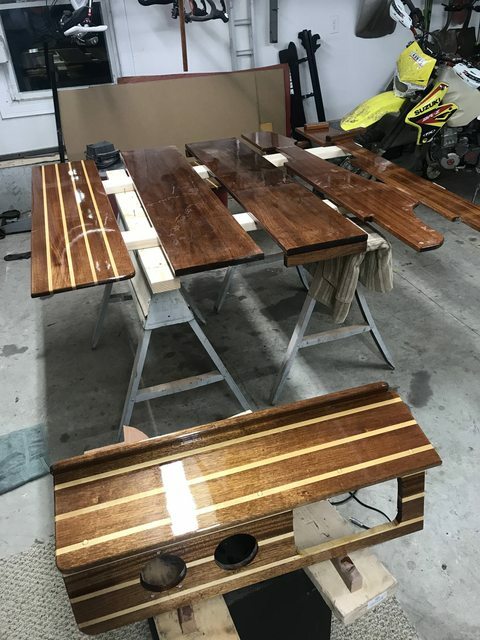 The joints will be glued with West Epoxy and then screwed with bungs sanded down to match the wood and then the process of varnishing starts and takes about 10 days to get the desired number of coats (10). 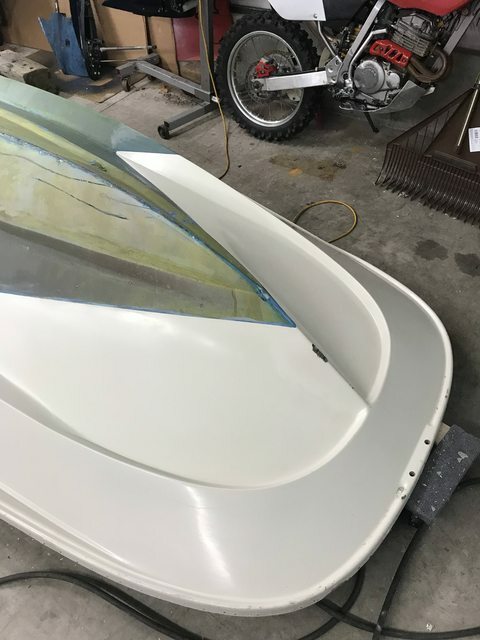 I'll work on the rear compartment this Sat and then be ready to sand and varnish the side pieces and rear compartment which should take me into November. 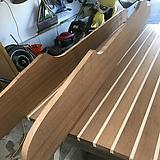 Eager to start on the hull, but want all the wood done and stored before starting. Not that this boat needs a chartplotter/fish finder, but it would be nice to sink something into that dash. Suggestions in a 5 - 6" screen? 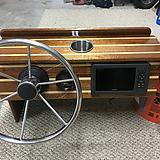 Looking at the Raymarine 5" Firefly units. 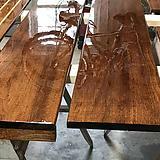 dtmackey wrote: Riptide and Dutchman - here's a good link on the different woods to use for interior pieces. 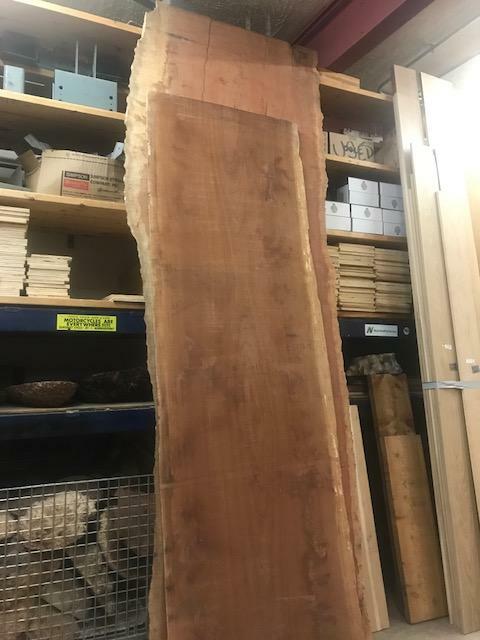 Mostly milled to thickness but rough is also available. Raymarine 5 would be nice. Again great work you do. Quick update. 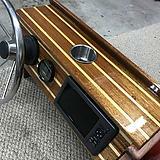 Console it in the varnish stages and should have 10 coats by Tuesday and just in time to cut in the Garmin 74SV unit. A 7" plotter/fishfinder will be located where the square opening is and extend toward the left. The original square was for switches, but those are moving to another location since the GPS is more important. Other holes are steering and Yamaha tach. GPS will fill a large area of the dash top to bottom and flush mount. 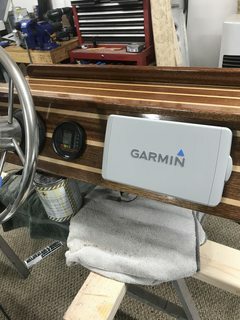 GPS plotter/fishfinder arrives for the dash tomorrow so I'll mount that into the dash tomorrow night and move the switch panel. 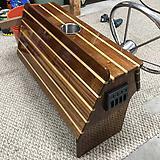 Over the weekend I fabricated the sides and rear seatback. 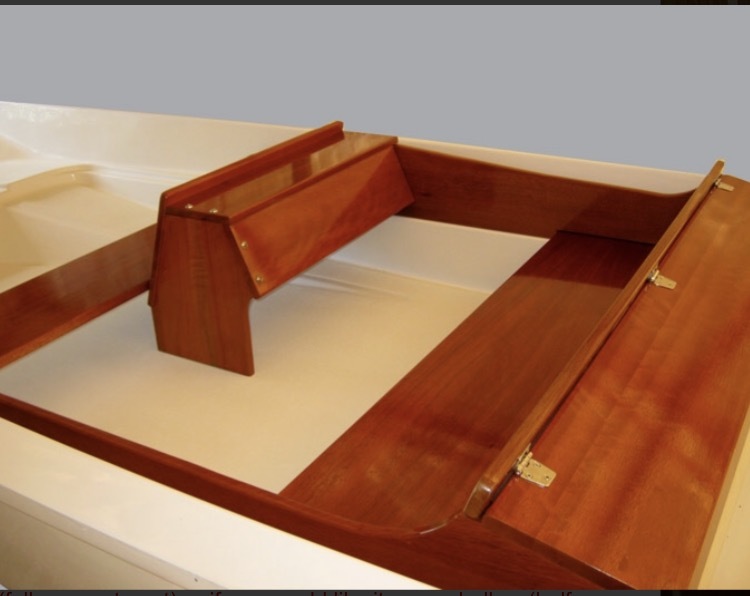 Just need to make the rear compartment back piece and cut the compartment cover, which is the same teak and holly look. I have the plastic insert, but that may not work since I've modified things so much, so I may need to start with a clean sheet and bend up a new insert. Gas fill is mounted and put the motor on a stand, it was previously on the floor on pads. 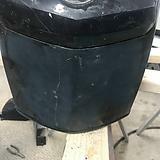 Motor will get a makover before mounting on the boat. 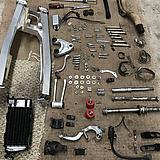 It is a clean freshwater motor with compression near the upper Yamaha spec. Would have been much quicker to copy the original interior in straight mahogany, but I think the extra time invested is worth it since it won't look like every 15' Supersport out there. It will never look like any other Super Sport out there as it will and already is looking much better(than new) with your workman ship. UPS man stopped by, so I mocked up the console to see what it will look like. Also came across another option for the nonskid and ordered samples to evaluate. 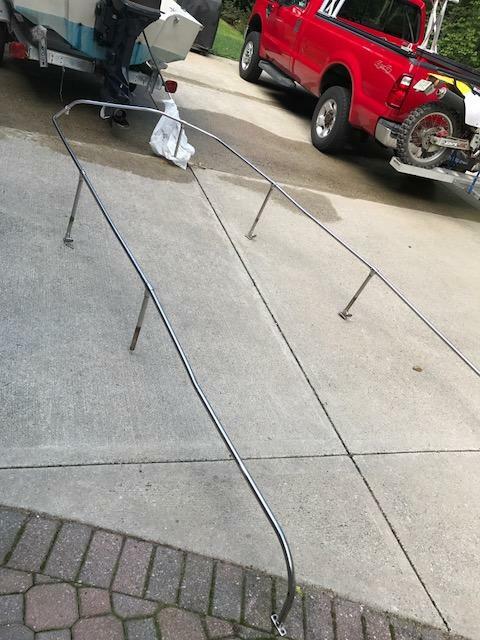 Was going to do a custom non-skid like my current 13', but if things work out, I'll be switching up that plan. Do you think your knee is going to be in the way of seeing the GPS screen? 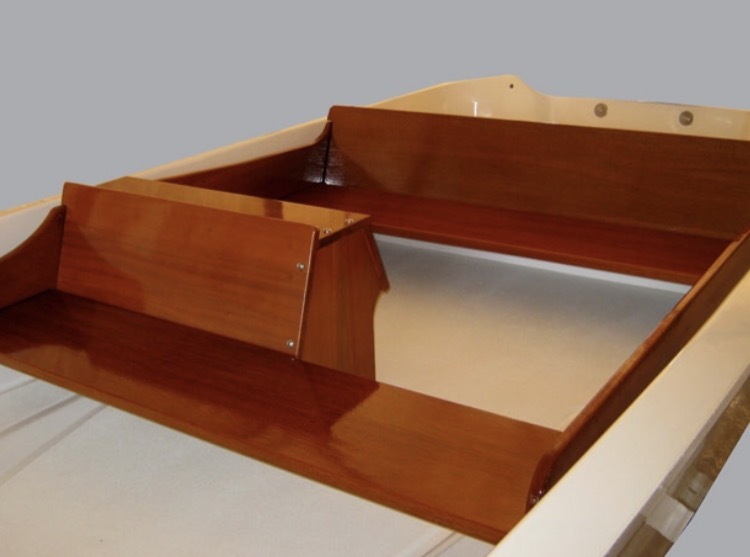 I'm 5'8" so I fit in smaller boats a bit easier than someone taller, but you are right, the seating, wheel and console are a tad low and not wanting to sit like a frog with my knees sticking out holding the wheel in the middle was a concern. I mocked the interior before cutting anything and decided the rear seat needed to be raised 1.5" and the console I believe I raised 2" (it could have also been 1.5"). This provides a more favorable seating position and the tach is viewable inside the rim of the wheel and the GPS lies outside the wheel rim. This is probably one of the reasons this project is going slow (other than my job getting in the way). I think things through, mock up and think more before action. 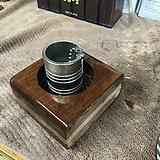 The dash is at a 20 degree angle, which is stock to the Whaler console. 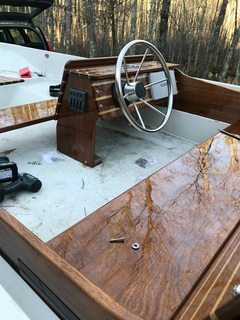 I also had a nice Schmidt smaller wheel with the finger grooves in the back, but decided against using with the 70hp and stuck with the Whaler stock wheel. 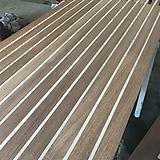 Ordered some EVA Faux teak deck material to test and play with to decide if I like it. 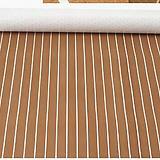 Was thinking this would be applied to the deck (floor only) where ever there is non-skid currently. The rest of the interior would receive a nice sprayed coat of Awlgrip. The EVA material is dense and has a good grip (wet or dry) and stands up to a beating. I think it would offer better grip than Awlgrip with Griptex mixed in and definitely provide a better grip for the dog. 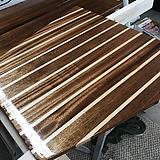 The teak and holly look should compliment the woodwork. I've been slacking this week with work distractions, but getting close to done on the varnishing. 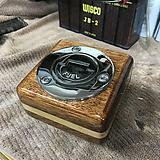 I'll grab another can tomorrow and continue as the varnish I have is thinned and going on too thin and after sanding, I'm not getting the build I'd like. Wood looks funny in the pic, that's dust. 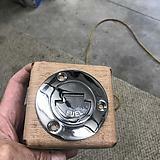 Been thinking about the finish washers that Whaler uses to secure the interior and using the same. 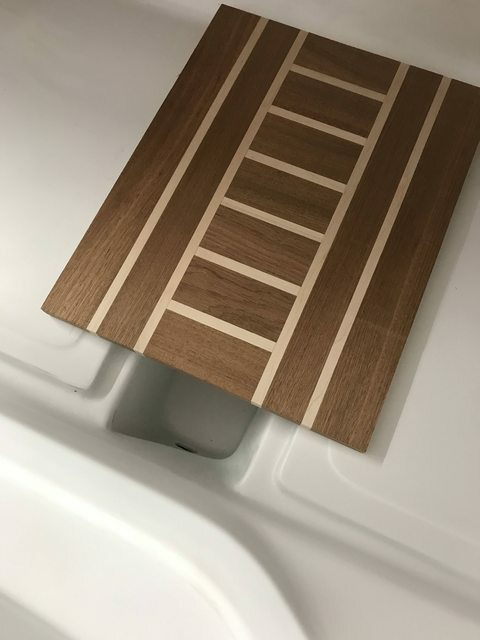 I've always had one big complaint with flat washers as they dig into the finish and allow water to penetrate the wood and discolor. 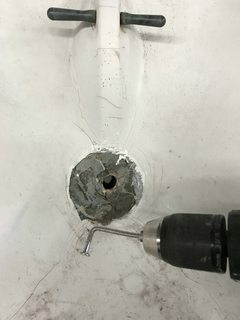 While its minimal, I didn't want this so I decided to go all 316 stainless and use 316 washers to back the finish washers and this provides a flat surface under the finish washer spreading the pressure and will preserve the finish. The best part, is you can't tell the flat washers are there and it appears clean. 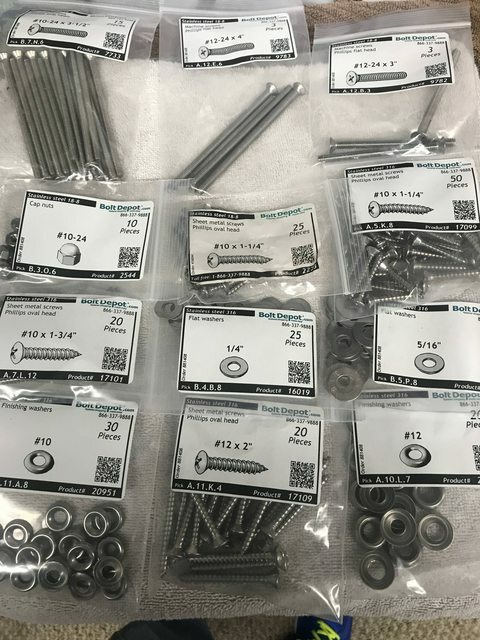 I find that Boltdepot.com is a great source for fasteners. Since this was 316 stainless I only bought what I needed, but usually buy in bulk for my bins. Prices are great and I have no affiliation with the company. Engine decals arrived and these are from a new model to freshen things up. 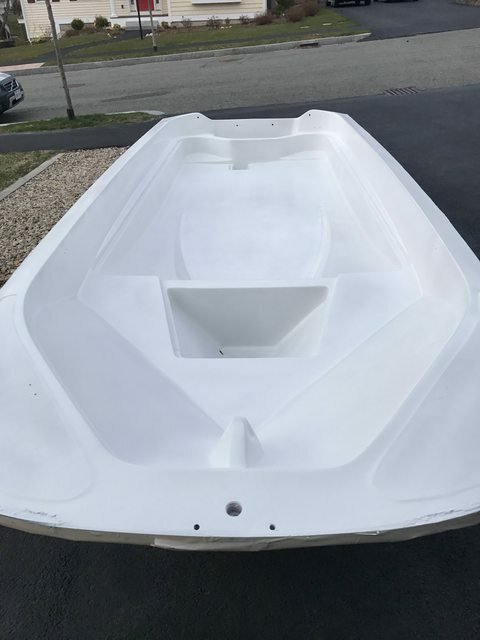 I may prep the down and shoot with acrylic urethane to get ready for decals and focus on the rest of the motor in the spring after the boat is ready. Looking superb! 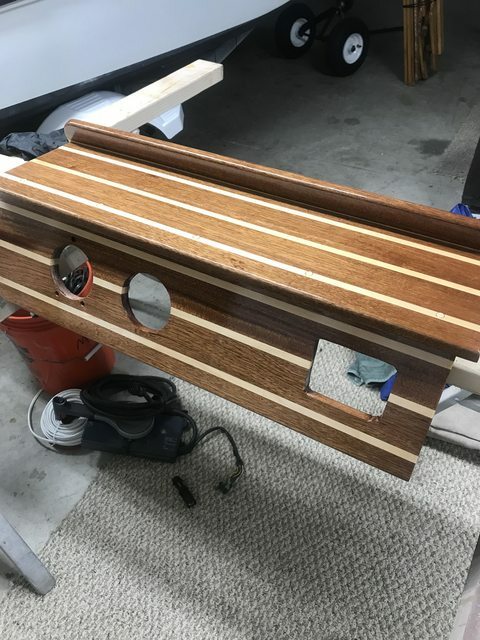 I am also considering the EVA faux teak for my new Montauk project, I've used it on another small RIB and came out great. Are you planning on sanding off the non-skid first? Mattwarner wrote: Looking superb! 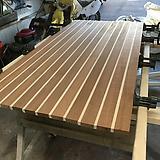 I am also considering the EVA faux teak for my new Montauk project, I've used it on another small RIB and came out great. Are you planning on sanding off the non-skid first? Prepare for the Whaler loyalists gasp, but yes, sanding off the non-skid and will Awlgrip the inside and then apply the EVA foam after I receive the sample order and put it through the paces to make sure it's what I want. 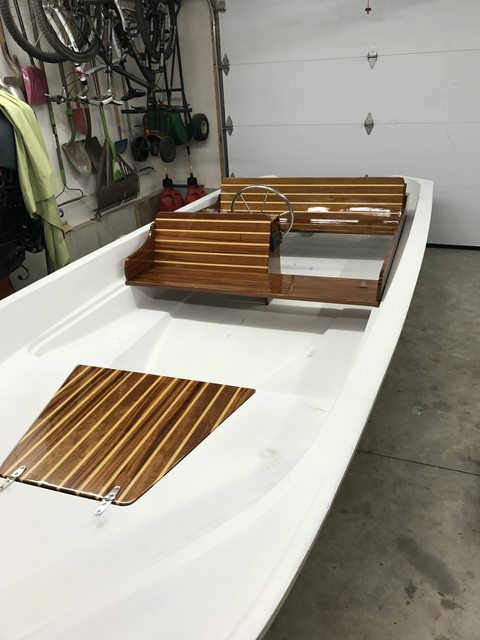 The boat has the typical Whaler gelcoat crazing, so it needs to be addressed and I was originally going to non-skid the inside like I did my current 13' Whaler and have been pleased with that. I feel the EVA foam could be a better solution and also look nicer than original. 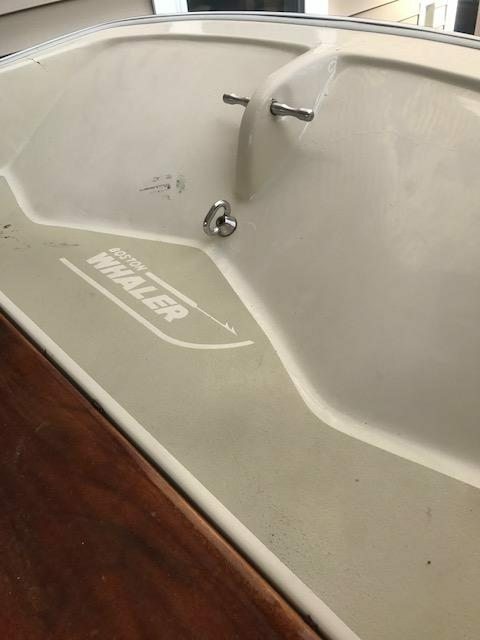 To be honest, the Whaler non-skid is as good as it gets, but with water, non-skid cannot match the traction of a Awlgrip finish with griptex sand mix or EVA foam. 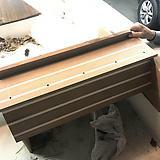 Console is finished and just need to test fit and install the fasteners. 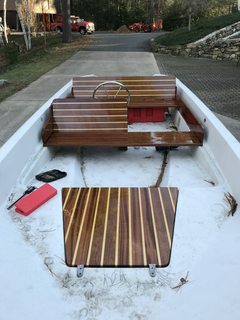 Side pieces and seats need another couple coats, so when those are done I can fit to the boat. The switch panel was moved to the side where I had more room. 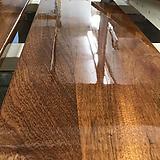 Faux teak arrived today and I'm not sure what to think. 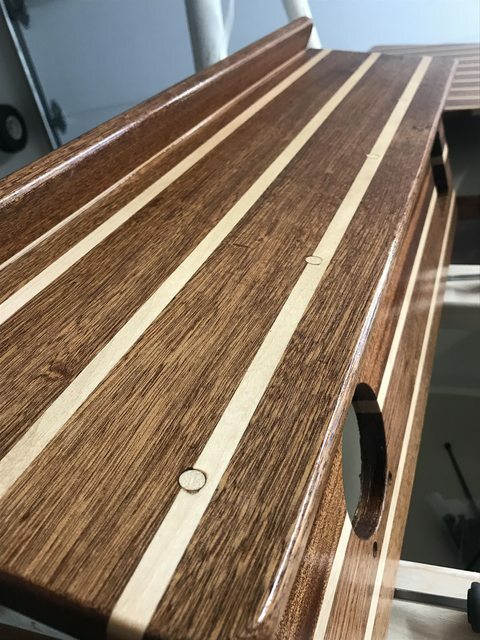 It feels great on the feet, offers more grip than gelcoat non-skid, but the white color is too bright and I think it clashes with the real wood in the boat. Maybe if I go with the black lines it would look better and be enough contrast. I beat the piece up with sharp objects, sandpaper and more and it seems robust enough. I'll solicit any input and opinions. 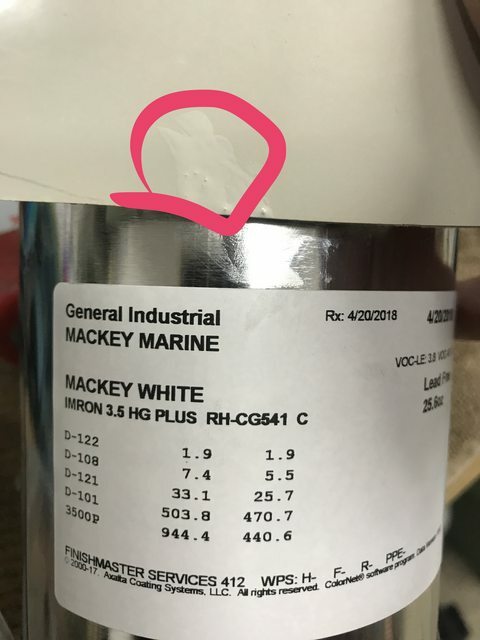 Is it too white because you used a Captains type Interlux varnish which has a hue but makes the wood look great with it's golden hue. 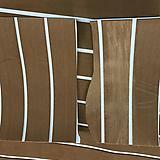 Maybe use an artist brush and varnish the stripes in the faux but that would negate its purpose of no maintenance. 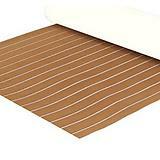 The other thing is time will tell with use and sun exposure the bright white will probably dull and yellow slightly. 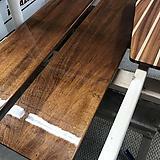 Dutchman wrote: Is it too white because you used a Captains type Interlux varnish which has a hue but makes the wood look great with it's golden hue. 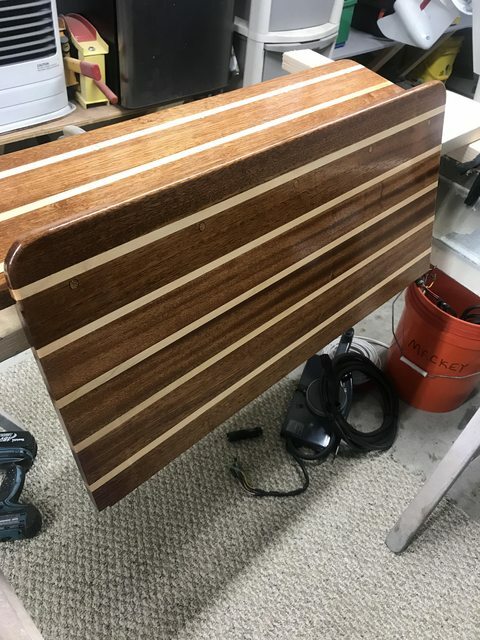 That was one of my concerns, but thought the black striped with faux teak would be the other option, but my concerns is durability and removing the stuff is no treat and after replacing my son's WaveRunner padding last winter, I think I may have talked myself out of the faux teak. 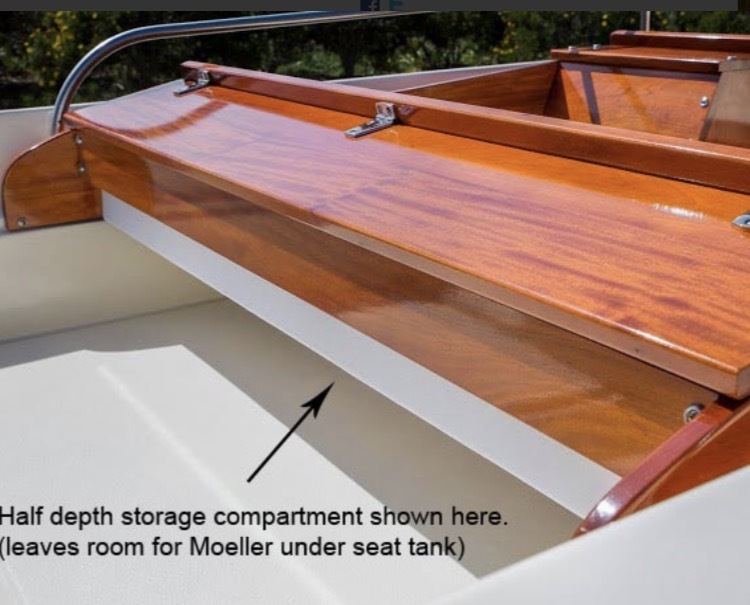 I may re-purpose the roll and install in my AB RIB since that's an aluminum floor and if removal is needed, it will stand up to chemical or mechanical removal better than a Whaler interior. Sorry for the misunderstanding as you pictures show white stripes. But, yes, you are right about applying it to the aluminum floor in the RIB. That would be a good look. 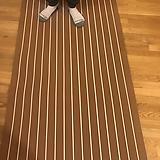 I have wooden floors in my Achilles and I think that looks nicer than the aluminum, but it is more slippery because it is straight varnished without anti-slip. Good luck and keep up the great work. Installed the interior today so I could measure for the storage hatch and back piece. 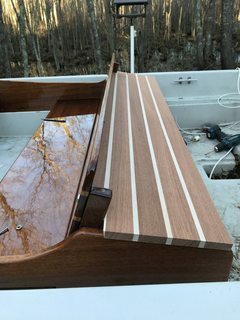 Once done, I removed and stored the wood pieces with moving pads to protect the finish until the final install comes spring when the hull is Awl-gripped. 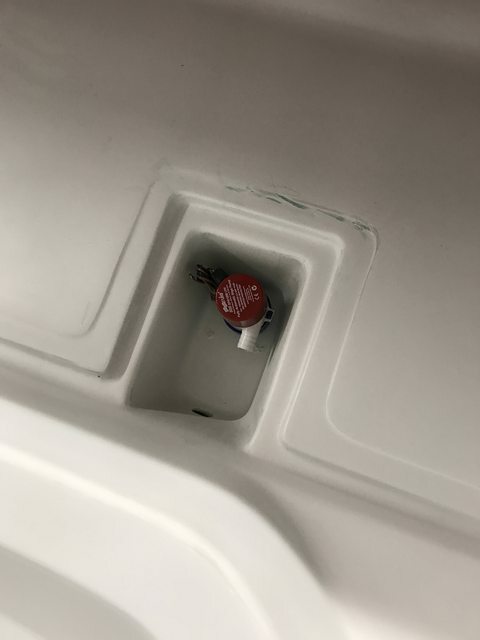 The hatch will not be hinged because of the seat back and there's so way to effectively hinge it and not fight the angles and it hitting when opened/closed. So, the top will have cleats on the inside and use ball and socket attachments that are hidden inside and keep it retained when bouncing over a wave. 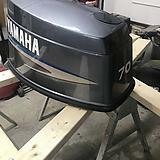 Started on the Yami 70 cowl and ready for primer and paint so the new decals can be installed. Speaking of motors, tomorrow I'm purchasing an Etec 75 for $395, yes that is correct, $395. Motor was not winterized properly and locked up from sitting so long and they just want the space. The motor was previously listed at $2,000 running some time ago. So now I have the option of installing the Etec 75 or Yamaha 70. 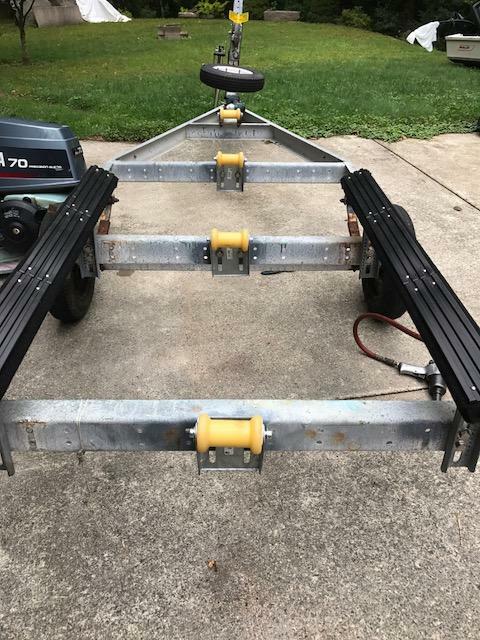 Regardless, it was too good a deal to pass up and I may just flip the Etec since it weighs 100# more than the Yami and I feel it's a bit much on this boat. 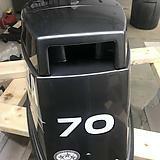 Shot the cowl with epoxy primer and acrylic enamel last night and it setup quick so I was able to get the decals on it. 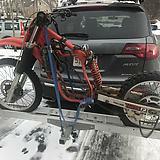 Yes, that's an EPA 3 star decal on a carbed 2 stroke. Do you have any finished pictures? 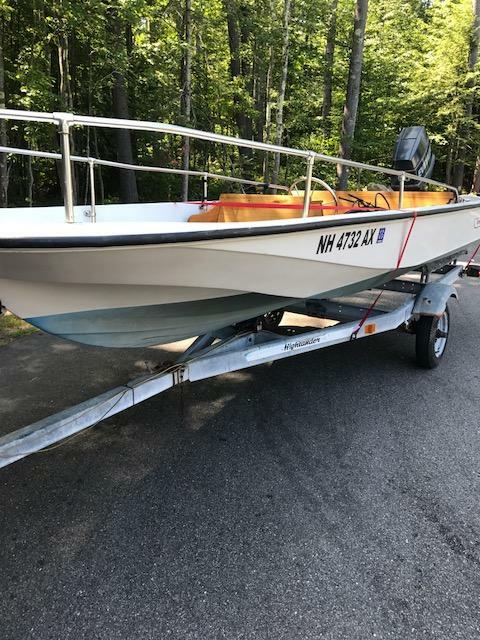 This is a really nice whaler. I have a 15 Sport with SS interior that needs work. Waterfun wrote: Do you have any finished pictures? - Etec 75 cosmetics, already ready to paint and then download engine data and sell. 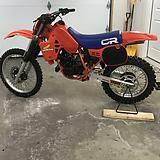 - Restoring a 1984 CR125 dirtbike - had one as a kid and just wanted to restore one and just hold onto it as garage art. 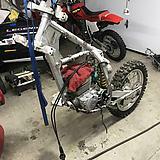 - Restoring a 2000 XR250 dirtbike for my son. 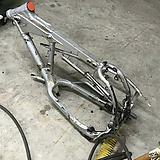 Stripping so the frame can be sandblasted and painted before reassembly with clean and new pieces. 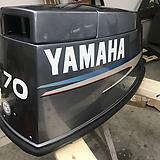 I think I'll start the Whaler in mid to late April, but may start on the Yamaha 70 in late March. With the raised claimps did you ever consider adding a support bt the gunnel and clamps? 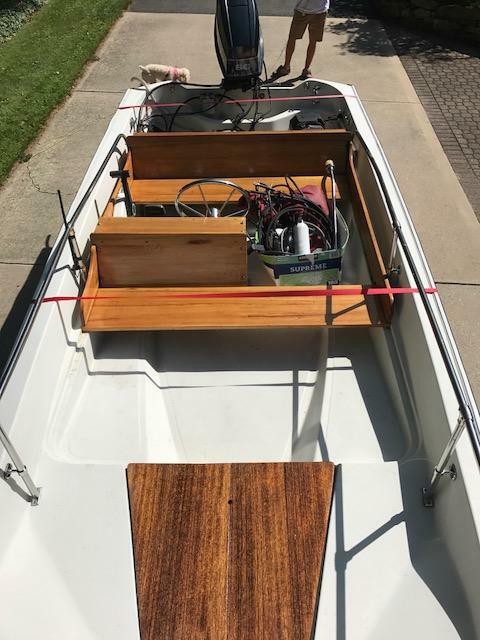 I’m putting my seat on top of a 5 inch clamp and am thinking of developing a starboard block that would go on the outside of the clamp to help keep the rigging neat and prevent any side to side motion in the assembly. 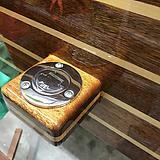 Surfhunter - we seem to be crossing paths on another forum. I'm not grasping the full idea of what you are explaining and it's probably something simple. 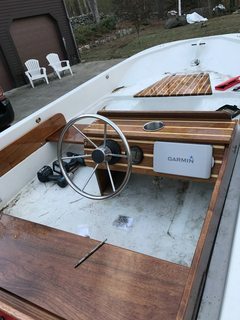 I ordered the Teleflex control cables today and will not be thinking about rigging install until the interior is painted and the mahogany starts going in. 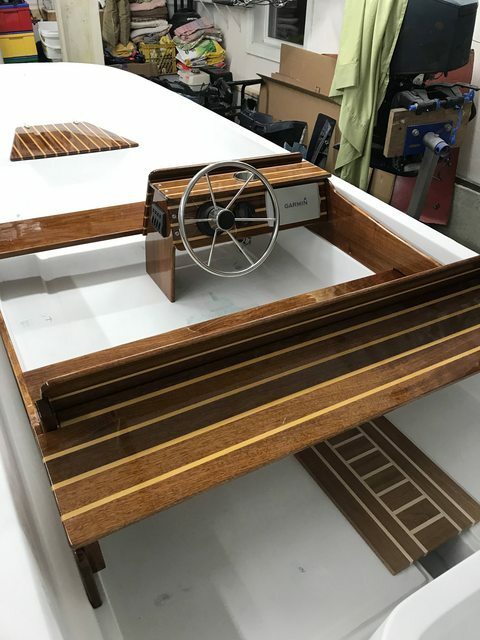 I believe the steering cable will be routed between the riser and the gunnel with the control cables and wiring running below the seat and than marrying up to the steering cable and in a loom material back toward the motor. 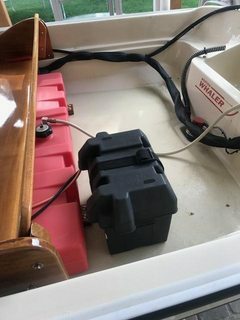 After we discussed the battery, I believe the Optima you suggested is more than adequate for a small 70hp 2 stroke Yamaha and that will allow me several mounting location options. My goal is a clean interior with the battery and located in areas that will not be stepped on or around. 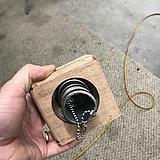 I attempted that with the 13' I just sold and you might be able to see the wiring in this pic. In this project the fuel line will be in the cable mesh run to the motor. D - I am following you on multiple forums. Hard to miss your project! Sorry, I was not clear in my last question but your picture answered my question. the backrest assembly in the supper sport interior provides strength. 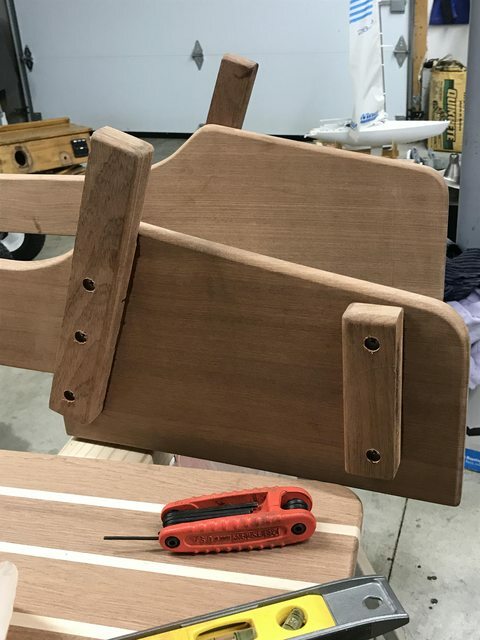 My interior is raised but does not have the supper sport back rest so I’m thinking about ways to reinforce the clamps to stop side to side motion. Like I said, I’ll need to get some pics up. I’m getting close! Excellent boat and thanks for the details. Crazy winter with snow, 60 - 70 degree days in Feb and then back into snow. I was temped to dig it out earlier, but glad I waited. 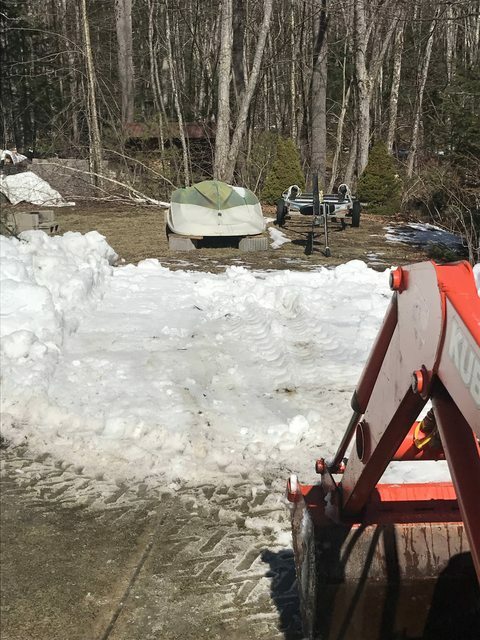 Today I removed the snow obstacle with the Kabota and flipped the Whaler over and put back on the trailer. 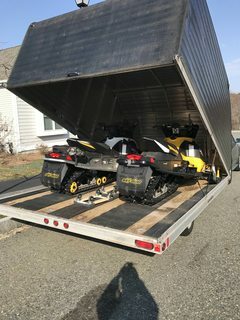 The plan is to pull it inside in 2 weeks and spend every night on the interior while my wife and daugher are in Mexico and my son is skiing in Canada. They felt bad leaving me home, but I think I got the better deal since I'm eager to wrap this project up. 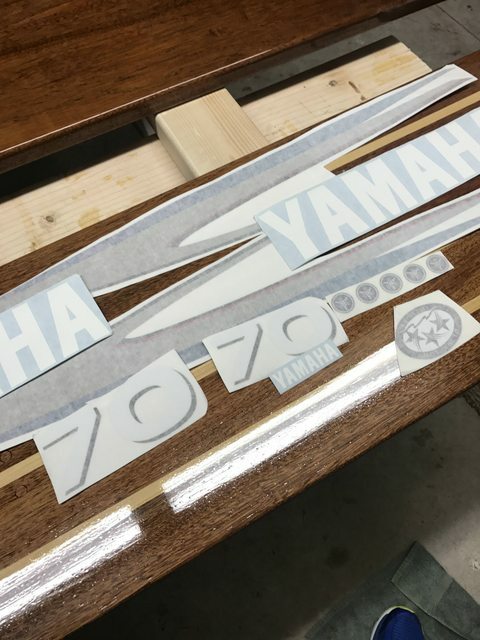 More to follow as I'm wrapping up the 70 Yamaha with paint and also the Etec 75 with paint as well. 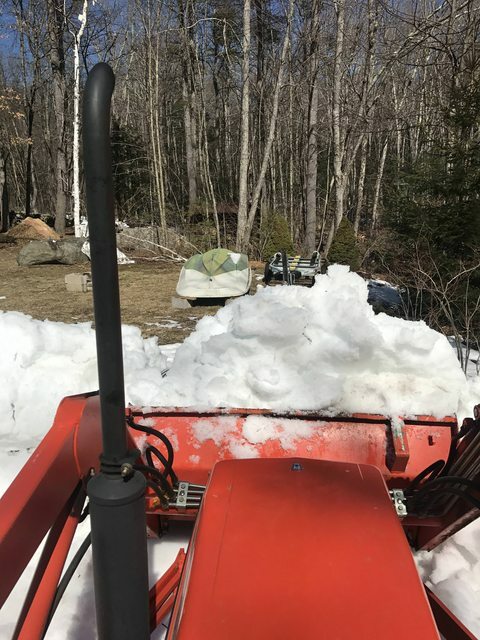 Winter is over and the Etec snowmobiles are summerized just as easy as the outboards. A combination of buttons and they go into a self fogging mode and save the headache of manually fogging. 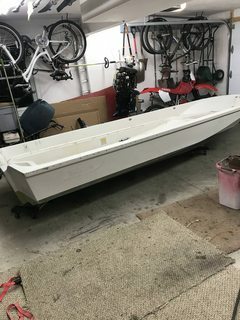 Now with room in the garage, the Whaler is positioned for work. 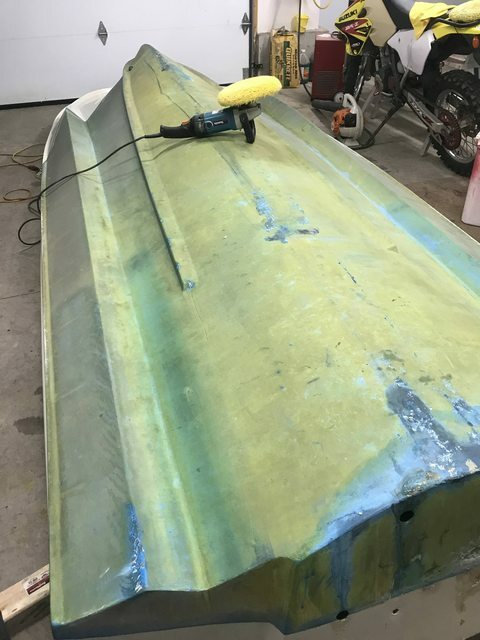 I will flip it over in the next couple days and focus on the bottom since there is one small bump on the keel, then compound the outer hull and install new Whaler decals and paint the bottom. From there I'll flip over and focus on the spider cracks that are all over the interior. My son is on a plane from Boston to Vancouver to ski for 8 days at Whistler and my wife and daughter leave for Cancun in a couple days for a week and I'm home all alone with the dog and think I got the best deal out of this family vacation. 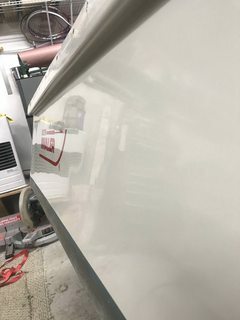 Buffed the hull today and it came back to near original luster. 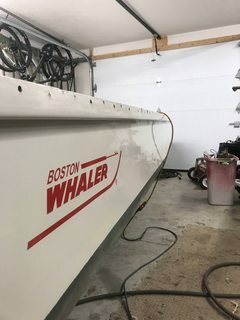 New Whaler decals also helped. 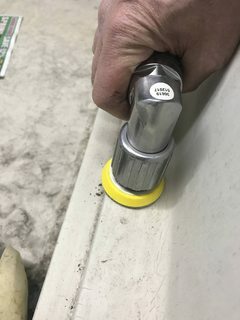 Picked up a 2" DA sander to save my fingers sanding the small areas. 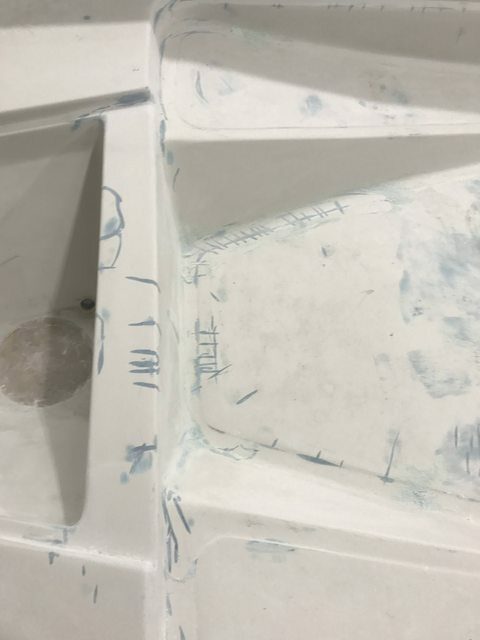 Bow eye was loose so I removed an then "hogged" out the material and filled with West Epoxy so it would be solid and lock the inner and outer skins together. 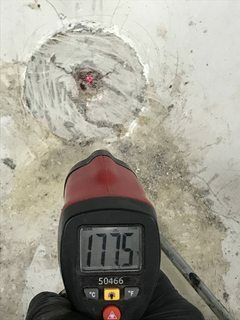 As the epoxy "kicked" it generated some good heat at 177.5F. 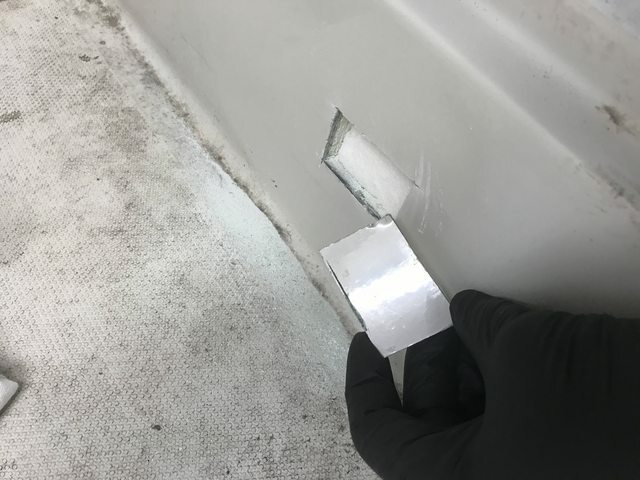 I'll epoxy in 2 layers of glass to make sure this is strong since the boat may see towing behind the bigger boat. 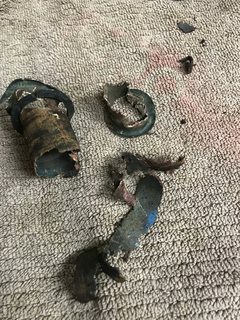 Remove the drain plugs and I strongly suggest everyone check your own. 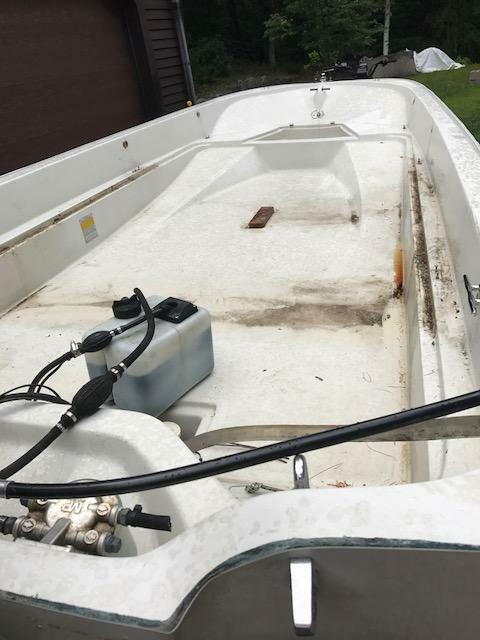 This is Whaler #6 I've owned and every one had corroded drain plugs. The biggest concern is once water gets in the foam absorbs the water. 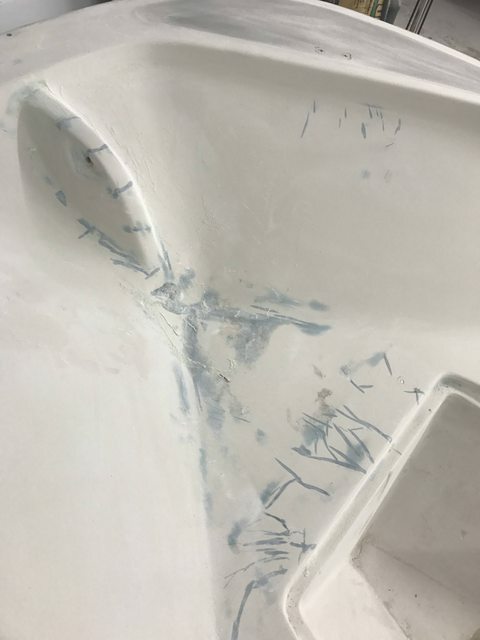 Next, I focused on several areas where the original seam failed allowing water into the foam and "hogged" out those areas with a bent nail and made ready for epoxy to lock things up. 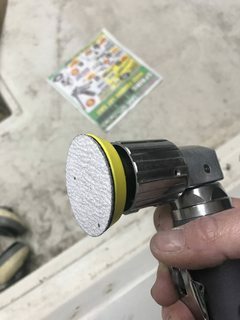 high pressure air and vacuum removed as much moisture as possible. 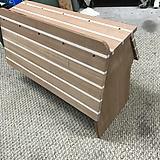 Next it will be flipped up-side-down and the bottom will be painted and a minor keel repair. After that, right-side-up and start chasing spider cracks and filling to make ready for primer. 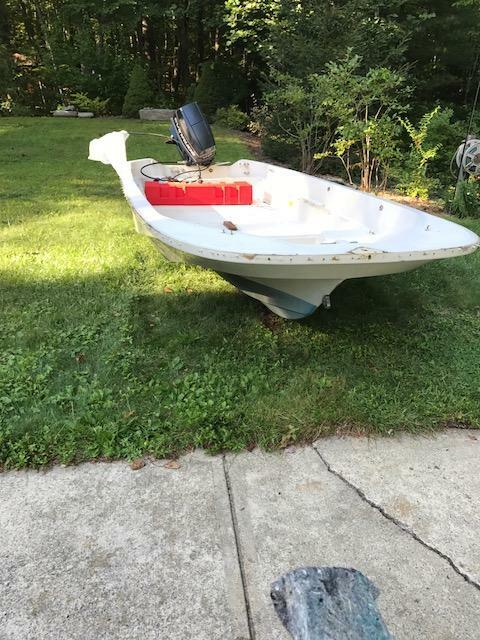 Flipped boat over then compounded and waxed the "smirk" and ready to focus on the bottom. 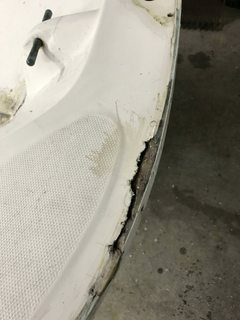 There are 3 - 4 spots that need minor attention and it looks like the hull got scratched from the trailer when the keel rollers had problems. 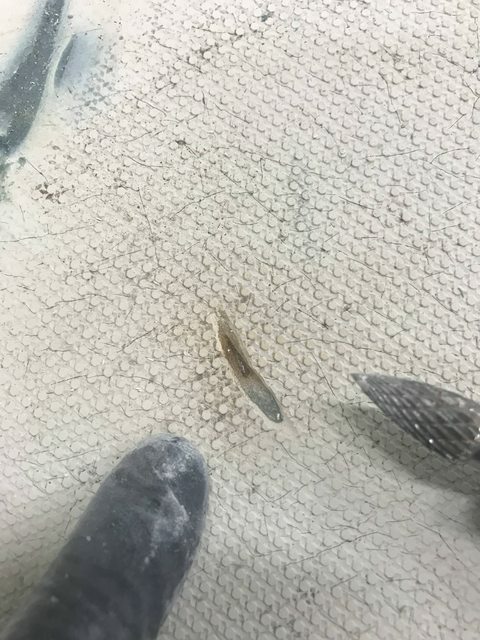 I called Awlgrip and spoke with Andy and he mentioned they have a custom Awlmix offering from specific locations, but they need a sample sent to their Texas location so they can analyze the color and provide the regional Awlmix facility the "recipe" for the exact match. The standard Awlgrip colors were kind of close, but still not close enough to match, so I used a multitool to cut a sample from under the rear seat inner than can be easily glassed back in to send to Texas. They will sent it back and I will glass it back in. 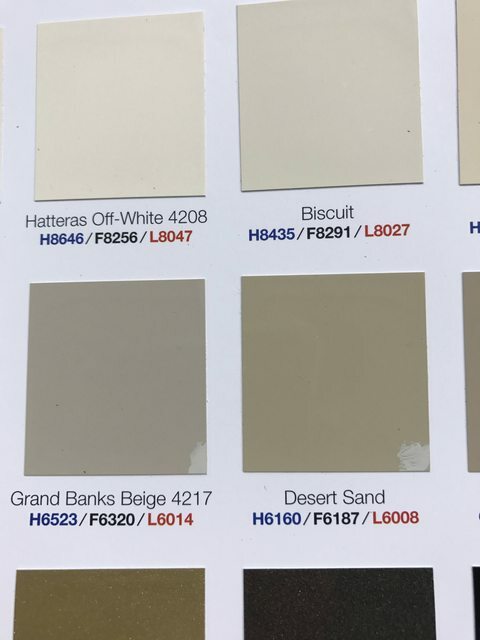 When I spoke with Andy at Awlgrip, he looked in the computer and had over 10 Desert Sand colors and said that he thought they'd already matched a Whaler interior, but there wasn't enough information to confirm this and he was very hesitant to release a "recipe" to the Awlmix facility in my area to find out I wasn't happy with the match, so I told Andy that I would follow up with the details so they could have the match for future Whaler projects. 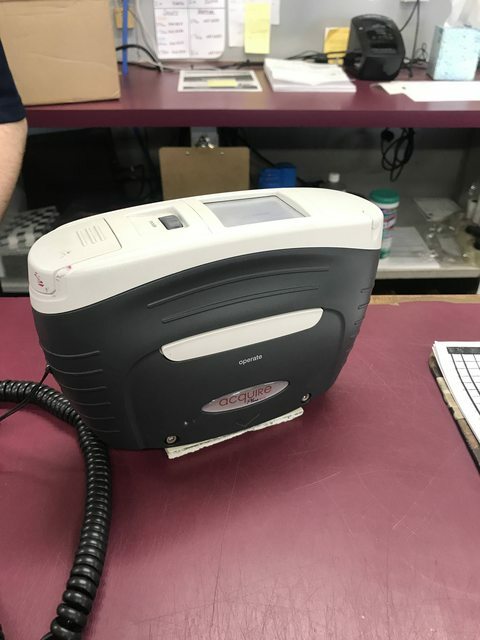 I decided the Awlgrip color match was going to add about 3 weeks to the project, so I went to my local Imron supplier and they used their $8K color analyzer to shoot the sample and formulate a recipe. 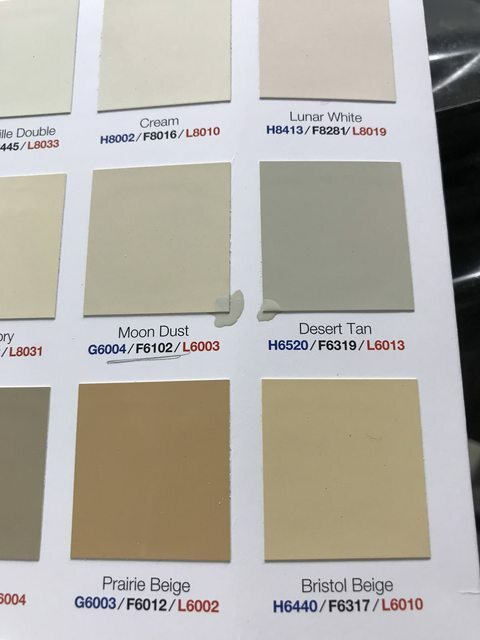 They named the colors, not me. The color in the red circle is wet and will dry darker for a perfect match. Spent far more time on the hull to correct a problem that was build related. 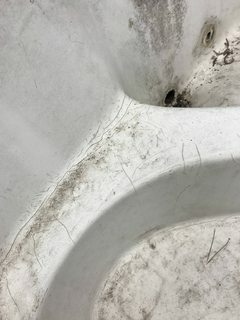 The hull had excessive spider cracking in various areas and when I ground them down, I found voids, lots of them (air pockets) that could only have been from the build process of the boat. I wonder if this was material or process related. It was a frustrating thing and added about 8 hours to my project, but I think it is resolved and I'm now ready for Awlgrip 545 primer. 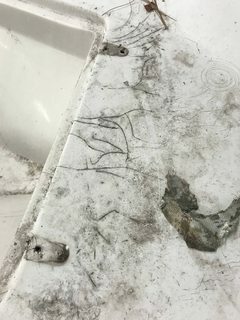 One other defect in the hull was a piece of iron I found cast deep in the gelcoat after grinding a bad spider crack and I wondered how does a piece of metal get into the layup of a boat.... 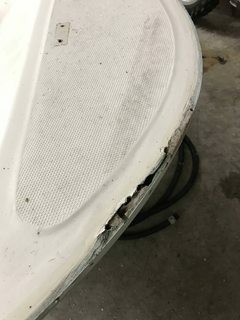 Tested with a magnet and this was an obvious screw up when the boat was built. 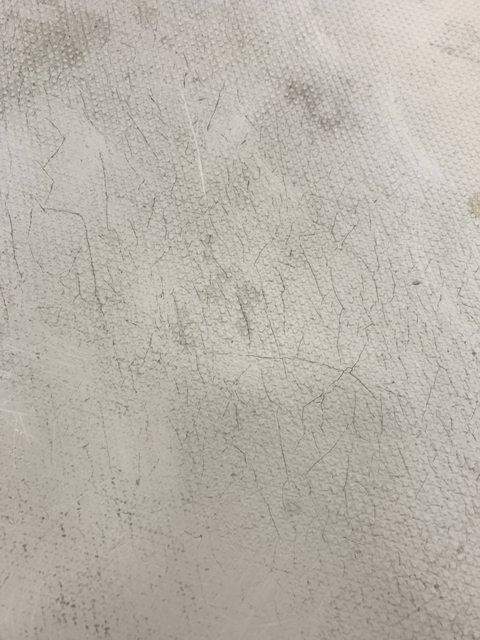 Voids from the layup process. 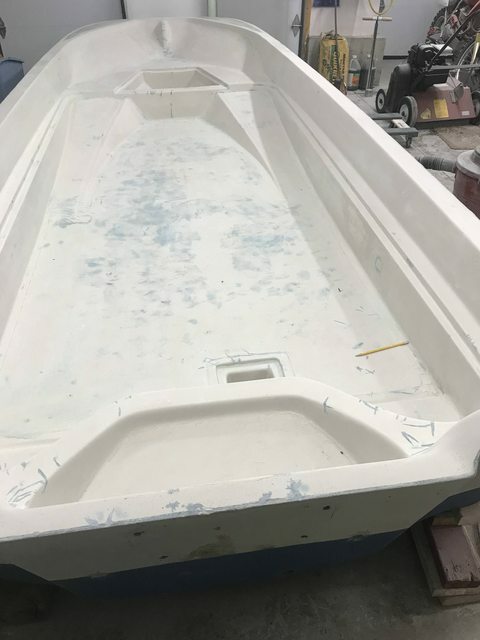 The hull is now ready for Awlgrip 545 primer and should get sprayed tomorrow. She's dressed in Awlgrip 545 primer and it's nice to see the interior all in one color and clean looking. 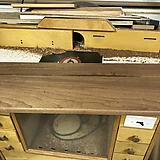 There's some sanding ahead for me, and I hope to get it done before the weekend and then decide my next steps. 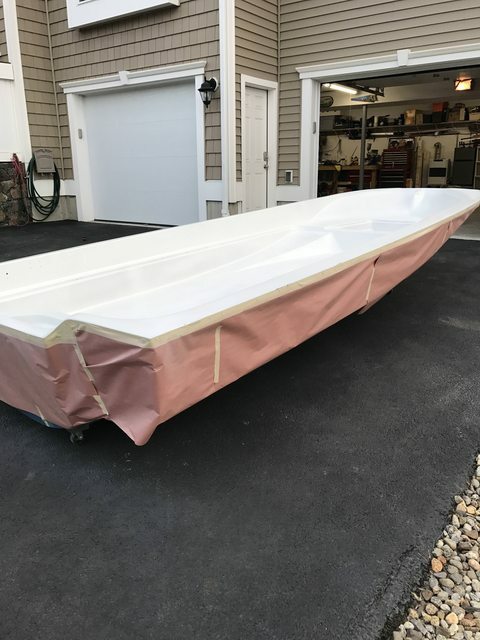 I sprayed the primer outside; it was a tad on the cool side and we have rain rolling in tonight, so it was get it done now or wait 24 to 48 hours and lose one or two evenings of sanding prep work. I can't spray the Imron in my garage since it will make a mess and the problem of breathing since I do not have a positive pressure breathing mask, so I'm calling a friend to see if I can borrow his bodyshop and spray at his place. Ideally would love to spray the smooth interior areas this weekend and then bring home. The non-skid areas I would attempt outside since anything floating in the air wouldn't be an problem in non-skid. For anyone looking for Awlgrip color comparisons I offer the following color samples and codes from their offerings. 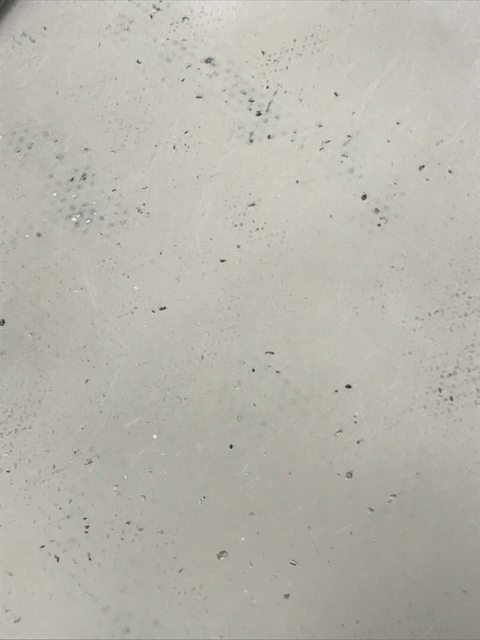 I dabbed a little dot of the color matched Imron to my interior sample and you can see the differences between the four closest Awlgrip colors. The colors do not render well after taking a pic and posting in this thread, but you can get the idea on how close they are. 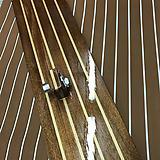 The idea will be to spray the non-skid a shade or two darker than the smooth so it gives it some character. 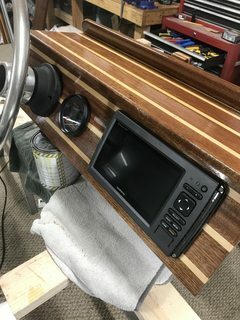 Did this in my previous 13' and other boats owned and like it. This is from the Whaler I sold to give an idea, but won't be doing the Whaler mask in the non-skid this time. 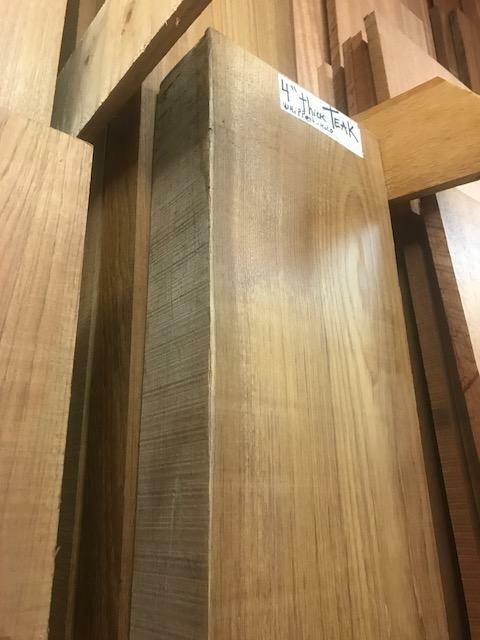 dtmackey wrote: Visited three lumber yards last week that carried exotic woods, and the first two were disappointing. A 50-mile ride to NH was worth the time and gas. This place has everything and I mean everything. This is just one of the wood sheds. 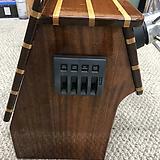 Would love hear how you got the mahogany and maple set up like that. 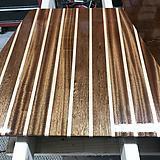 I'm thinking about just painting separated white stripes over wood. BWbert wrote: Would love hear how you got the mahogany and maple set up like that. 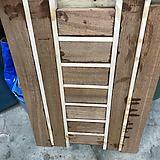 It's a lot of work and not as simple as gluing up some wood. 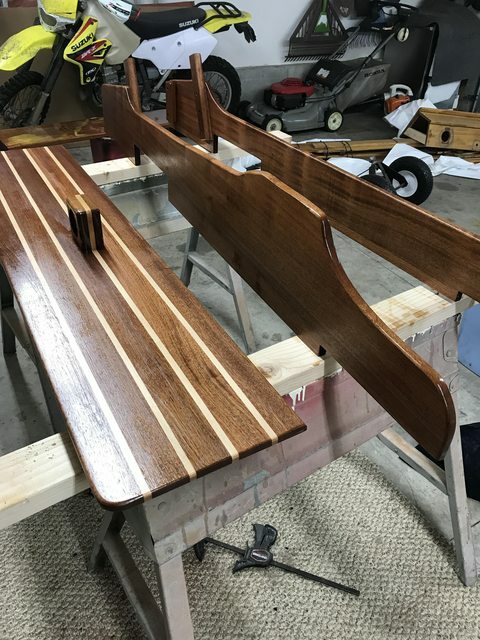 I have a good amount of time into this, but it's a labor of love and I enjoy spending time in the shop plugging away at projects. Decided to mock up the interior one more time to see what else is needed. 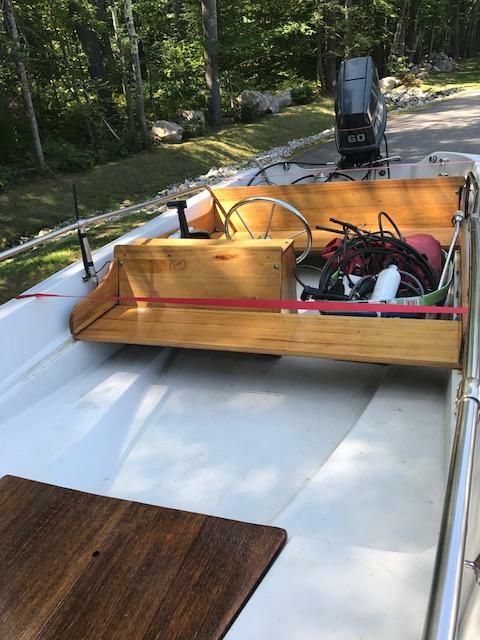 Since I modified the interior there are differences to what Whaler offered, but this boat is for my use and not the generic offering of what Whaler intended. I enlarged the storage to the rear since there's already a 15 gal tank that will be hidden under the seat. 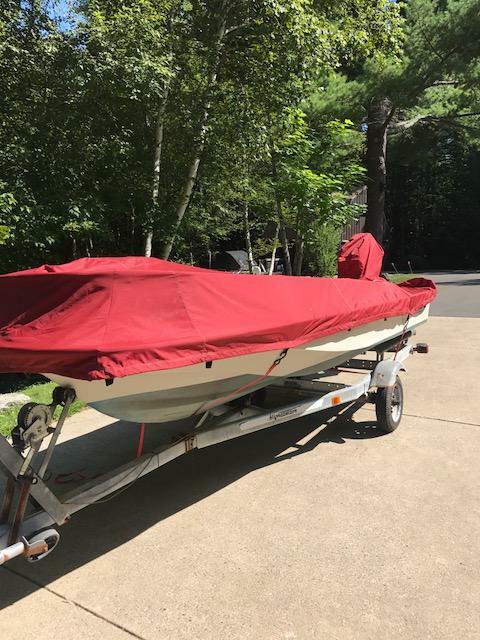 This still allows for water-ski lines and other stuff to be hidden. 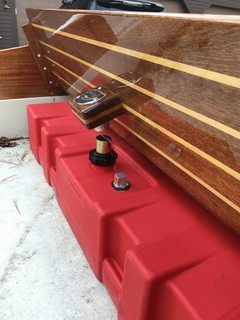 I decided on the Rule automatic pump like my previous Whaler and since the "bilge" on the 15 is larger than the 13, it presents a ankle buster hole that I feel is dangerous, so I will cut up a piece of wood that I glued up from leftover interior pieces and make a 70% cover for the "bilge". 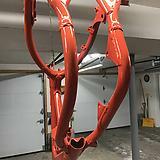 Mocked up the interior and itching to get color on the primer and then a darker non-skid color. Trying to arrange with a friend so I can spray at his shop on a weekend that he's not using his shop. As always she's looking great and first-class work.